The picture on the cover is a bit deceptive. 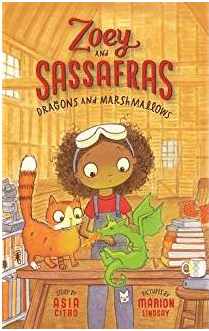 It might give the reader the impression that this will be a fictional account of a little dragon. 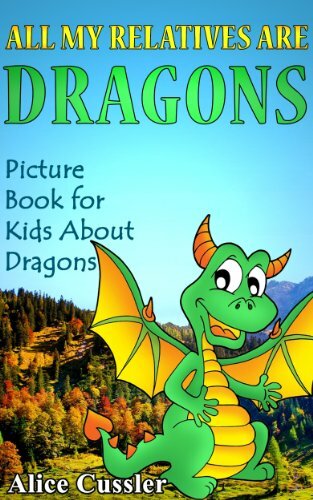 Rather, the author uses an interesting approach to teach children about dragons, reptiles, and lizards. Draco, the narrator, is a young dragon who has many relatives. He proceeds to trace its history by first going back to prehistoric times and the dinosaur epoch. He then moves on the discuss many of the myths centered around dragons including the European and Chinese Dragons. He travels around the world to show readers crocodiles, alligators, iguanas, and chameleons. Cussler presents identifying characteristics and brief highlights of each and notes the habitat of each. There are photos that illustrate the points that are being discussed. The language is easy to read and understand. I do wish the photos were larger as some of the details are difficult to see. I would recommend this book for elementary school age children. 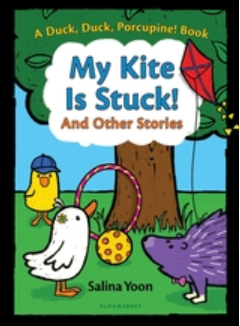 It is a good way to introduce nonfiction to children who love dragon stories. Teachers might use it as a starting point for a lesson about reptiles. Recommended especially for children ages five through ten. 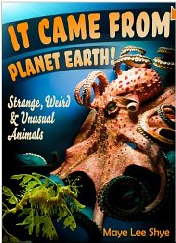 This book is a fascinating study of the habitat and behavior of strange animals living on land, in the sea and up in the air on planet earth. Also unusual is its appeal to all ages from younger children through adults. The author describes more than thirty animals and provides a photograph of each. Some of these have been on earth for millions of years. That’s right, the Coelacanth is the oldest jawed fish still alive on our planet. This fish with eight hollow spine fins covered by tough scales acting like a coat of armor can grow up the six feet long and existed on earth 410 million years ago! The Tuatara is the last reptile that lived on earth as a contemporary of the dinosaurs 225 million years ago. They still exist on remote islands in the Pacific Ocean and some wildlife sanctuaries. The Tarsiers are primates with huge eyes that leap from tree to tree. They are carnivores who are probably the ancestors of two legged primates. The slow loris is a primitive monkey with a very large round head and eyes. Their arms and legs are of equal size. This southeastern Asia native also bites with a poisonous venom lethal to many humans. Many animals have evolved with adaptations needed for their environment. There is an African Penguin native to the warm coast of Africa. These animals burrow in the ground to keep cool. Glands above the eyes high on their heads help them cool their bodies. The North Island Brown Kiwi is a bird that does not fly because its wings are tiny. The animal is the size of a chicken. Like a dog the kiwi bird uses its nose to find food. These animals live in underground burrows. The male sits on eggs in the nest, while the female goes out to hunt for food. Their eggs are the largest known bird eggs. New Zealand has adopted this bird as their national symbol. Giant Tortoises living in the Galapagos Islands can weigh up to 600 pounds so their bodies have been adapted to move slowly and burn few calories. In fact, they can go as long as one year without eating or drinking anything! There are many animals with adaptations that make them look strange. The Glass Frog lives in Venezuela and central America. Its body is translucent so that it is totally invisible to predators. The Shoebill is a bird that lives in the swamps of east Africa. It is related to the stork, but its bill looks like a giant shoe. This cartoon like character spends most of its time standing silently along the water, but can fly at low altitude. When it does fly, it usually flies in a group that chatters. Archaeologists have found drawings of this bird in ancient Egyptian art. The Okapi is a forest giraffe that has black and white legs like a zebra. Its tongue is so long that it can wash its ears! One animal may someday help us find a cure for cancer. The Naked Mole Rat lives in tunnels on the desert coast of East Africa. This animal uses little oxygen and has no hair. It does not feel pain and appears to be resistant to cancer. Its life span is longer than any other mammal of comparable size. Another oddity is that these animals are eusocial like bees. One female is designated queen; all the other rats will work to sustain the colony. More than thirty animals are discussed in this book. The work may serve as a springboard for analysis, discussion, comparison and evaluation of topics in life science, geography, evolution and environment. I recommend it as a valuable learning reference tool for adults and children of all ages.